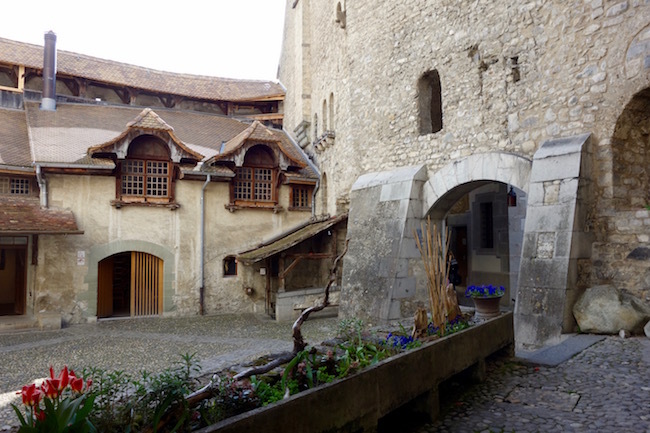 If you’re travelling to Lake Geneva in Europe, don’t miss a trip to Chillon Castle, the Château de Chillon. Located just outside Montreux, this stunning medieval fortress has an idyllic setting, a shadowy past and a dungeon that has inspired scores of poets and painters. Today, Chillon Castle is one of the most popular attractions in Switzerland. Read on for my experience and some fascinating history, or scroll down for all the how to’s. Where is the Chateau de Chillon? Woe betide a solo traveller who gets stuck behind a tour group of teenagers while trying to fight her way down the steps to a castle dungeon. 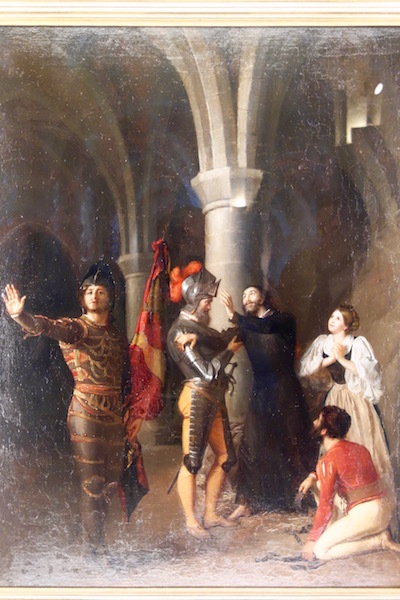 That was my fate at Chillon Castle – the famous Château de Chillon immortalized by Lord Byron in the poem, The Prisoner of Chillon. Outside, Lake Geneva was a silvery blue. Flowers were blooming all along the promenade from Montreux to Veytaux, but I couldn’t wait to sink into the shadows. 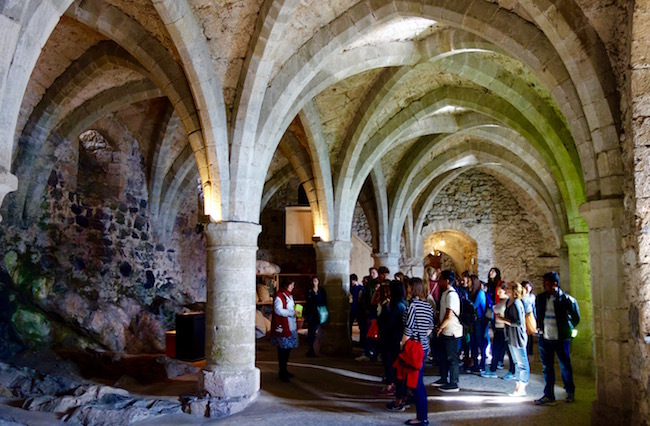 This was my chance to visit one of the most written-about dungeons of all time. The Chateau de Chillon, 4 km (2.5 miles) southeast of Montreux and 40 km (25 miles) from Lausanne, is the most visited historic sight in Switzerland, a dream of a castle that rises up abruptly from Lake Geneva, or Lac Leman. I was visiting on a day trip from Evian-les-Bains, but it’s even easier to visit from Geneva or Lausanne. Ahead of me the teenagers were giggling, sniggering, taking selfies and generally doing what teenagers do. 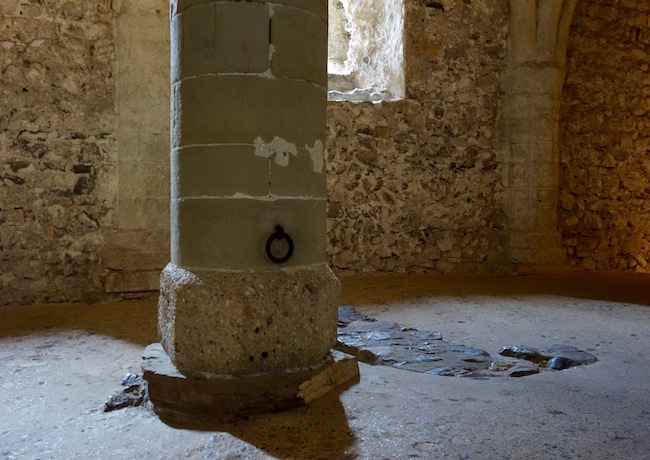 I tried to twist my way through, but they blocked the doorways as we shuffled through a storage room and into the prison, a cavernous room where François Bonivard, the original prisoner of Chillon, had been chained to a pillar. Locked up in the gloom, he was imprisoned in the Chillon Castle dungeon for four (or six, depending on who you listen to) torturous years beginning in 1530. Scooting around the tour group I made my way to the far end of the room, wondering if any of the teenagers even cared that this was the dungeon where Bonivard, a pastor from Geneva, was shackled to a three-foot chain. Unable to see out the windows, he was convinced his prison lay beneath lake level and could only imagine the sunshine outside. A burst of youthful laughter drowned her out. I couldn’t hear if Byron had gotten the correct pillar or not. (He hadn’t.) But did it matter? 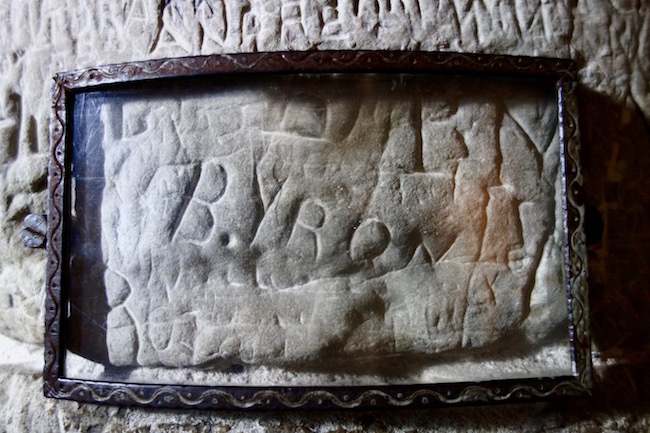 In a strange twist of celebrity, Byron’s signature and his romantic account of the prisoner of Chillon have eclipsed, or at least equalled, the suffering of Bonivard himself. The teenagers cleared out, leaving only a few couples and solo tourists, and I was free to explore the room. Stout pillars rose up from the stone floor like petrified trees. Slabs of rough rock slashed down into the dungeon’s stone foundations. 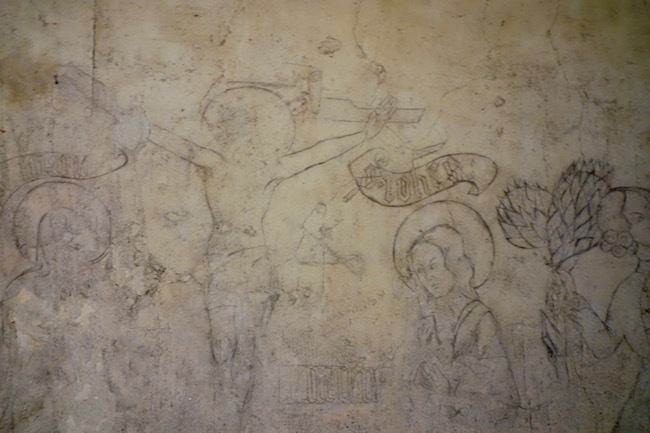 On the wall nearest the entrance, a mysterious crucifixion scene from the 15th century has been drawn in charcoal. No one knows who drew it. Hopefully it gave the prisoners solace as they lay here in chains. Reluctant to leave, I wedged myself onto a rock ledge. I wanted to soak up the atmosphere, to understand why Montreaux’s Chillon Castle has been such a powerful draw for so many artists. Considered one of the best places to visit in Switzerland, the chateau has a long list of literary admirers: Lord Byron, Percy Shelly, Victor Hugo, Mark Twain, Jean-Jacques Rousseau and Charles Dickens. It’s also inspired painters such as Delacroix and Courbet. The castle is charming to be sure. Rising up from a rocky outcrop on Lake Geneva, connected to land only by a wooden bridge, Chillon’s towers and turrets fuel our romantic notion of what a medieval castle should look like. In an age of replicas and theme parks, this popular Swiss attraction has an unrivalled authenticity. While the first written records of Chillon Castle date back to 1150, excavations show that the site has been inhabited since the Bronze Age. Its current form was built by Pierre II of Savoy in the 13th century. Strategically situated on an important trade route from England and France to Rome, it was constructed as a fortress, and became the summer home for the ruling Savoy family. The castle has never been destroyed but it has been conquered. When the Bernese invaded in 1536, Chillon Castle was conquered in just two days – an attack that resulted in Bonivard, the Prisoner of Chillon, finally gaining his freedom. How long could you stay here? “The cellar is lower than the lake?” a tall young man asked to his friends in surprise after skimming over one of the info boards that described Bonivard’s stay. “It’s not. Bonivard was mistaken,” I piped up from my stone perch. The man looked startled and I realized that with my outfit of wall-matching grey and beige I’d been nearly invisible, a ghostly prisoner come to life. “His chain wasn’t long enough to let him see out the high windows so he only imagined he was below ground,” I explained. The man didn’t seem to appreciate my helpful tips. Perhaps he wasn’t over his fright. He and his friends walked off with the briefest of nods, and for a blissful moment I was alone in the dungeon. The silence was heavy. It might have been my imagination but the presence of despair, hope and hopelessness seemed as thick as the three-foot walls. Bonivard and his fellow inmates (many of whom didn’t survive) weren’t the dungeon’s only prisoners. During a devastating plague in 1348, Jewish townsfolk from nearby Villeneuve were imprisoned and tortured here. They were blamed for causing the Black Death by poisoning the wells and food in order to destroy Christianity. Their captivity is a horror that doesn’t bear thinking about, except we do need to think about it, to acknowledge that this kind of ignorance and cruelty can occur. Today we think of Switzerland as a peaceful country but back in the 16th and early 17th centuries the Canton of Vaud – the region of Western Switzerland that the Chateau de Chillon is located in – was a hotbed for witch hunting. More than 2,000 deaths can be attributed to the killing of witches and the fortress was no exception. In 1613, a total of 27 convicted ‘witches’ were burned in one of the castle’s courtyards. Unlike Chillon’s many prisoners, I had the freedom to shake off the chill of the dungeon and leave the cellar behind. As I emerged into the sunlight of a courtyard I wondered if it was the castle’s grim history that had inspired Lord Byron and so many others? Or was it Chillon’s medieval beauty, highlighted against the stunning backdrop of Lake Geneva and the Alps, that captured their imagination? Maybe it was both, the grim and the glorious wrestling in some sort of irresistible tangle. Whatever the reason, the Castle of Chillon continues to cast its spell today. Chillon Castle is located on Lake Geneva in Switzerland near Montreux. It’s at the far eastern edge of the lake, about 100 km (60 miles) northeast of Geneva. The exact address is Avenue de Chillon, 21, 1820 Veytaux. While I was slightly obsessed with the dungeon, there is so much more to see. Highlights include the three courtyards and four impressive Great Halls once used for banquets by the Savoys. 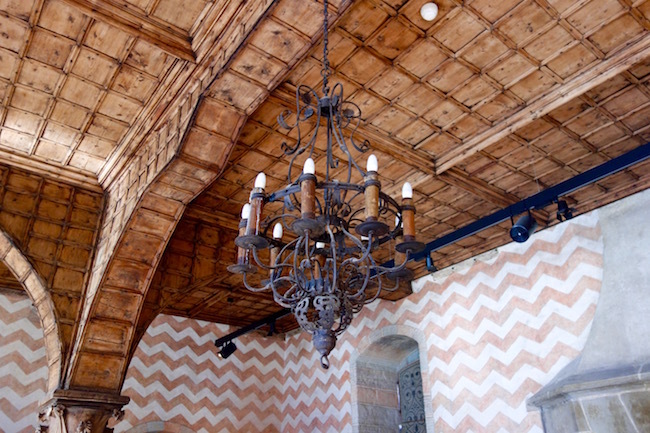 One room not to miss is the Camera Domini, which was for the private use of the Duke of Savoy. Particularly beautiful are the room’s faded 14th-century murals. There is a Weapon’s Room and the castle defences are well worth exploring with their sentry walk and double ramparts. The Peter II Room contains an exhibit about the history of the Savoys, and the gift shop is 100 years old. Get a free brochure and room-to-room guide at the entrance desk. Chillon is an island castle built on a rocky spit a few feet from the shore of Lake Geneva. The island has been inhabited since the Bronze Age. A castle has sat on the island for at least 1,000 years. Unlike most castles, Chillon is built in an oval ‘boat’ shape that follows the outline of the island. 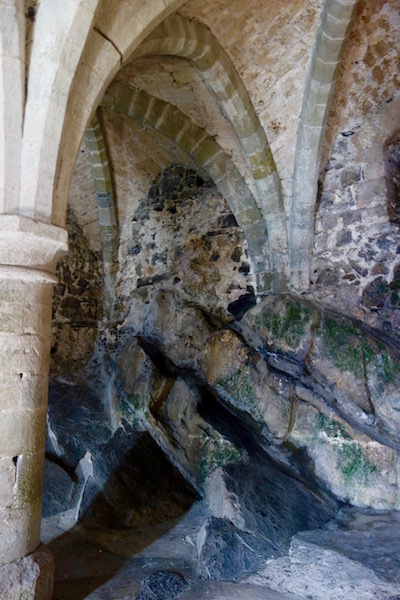 The dungeons are carved out of the rock that the castle is built on. Talk about gloomy. In the 13th century it became the summer residence for the Counts of Savoy. The Swiss Bernese overtook the castle in 1536 after a short siege. Inspired by the French Revolution, citizens of Vevey and Montreux occupied the castle in 1798, and it now belongs to the Canton of Vaud. A scene from Jean-Jacques Rousseau’s novel Julie (also called The New Héloïse) is set at the castle. Inspired by Rousseau, Lord Byron visited the fortress in 1816 and wrote his famous poem, the Prisoner of Chillon. 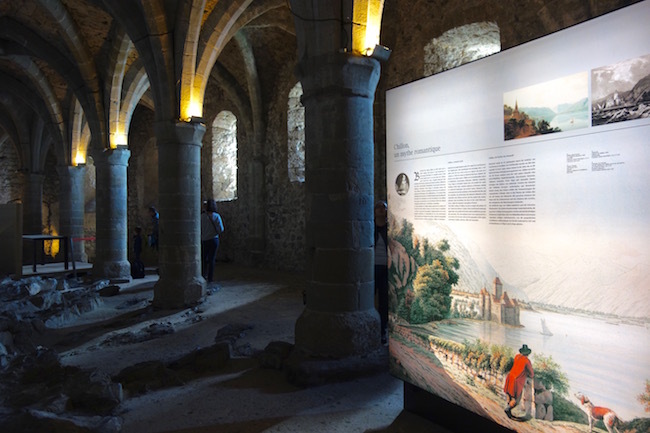 During the Romantic era of 19th century Chillon became a hugely popular attraction. Today, it’s the most visited monument in Switzerland. By train from Lausanne: To get to the Château de Chillon I took the train to Montreux from Lausanne (about 20 minutes). Walk: From Montreux I walked down to the waterfront and along the 4-kilometre promenade to the castle. It’s spectacular. Bus: To catch the bus back from Chillon to Montreux cross the walkway over the highway from the castle and you’ll see the stop. To get from Montreux to Chillon Castle by bus you can take VMC bus no. 201 from the train station to the Veytaux bus stop. Geneva to Chillon Castle: Take the train from Geneva to Montreux and follow the above suggestions. By boat: Why not sail on a historic paddle steamer? This is how Mark Twain did it, and it must be the most romantic way to visit the Castle of Chillon. During high season there are departures from Lausanne, Vevey, Montreux and Villeneuve. Boat stop: Chillon. To catch the boat back, the dock is just beside the castle. Check out the CGN website for details. From Evian-les-Bains: I took the boat from Evian-les-Bains to Lausanne and the train to Montreux. It’s definitely do-able as a day trip. Prices are Adult CHF 12.50, Child CHF 6. You can buy a ticket at the castle or book online beforehand on the castle website. Chillon Castle hours: During April to September, the castle is open from 9:00 a.m. to 7 p.m., with last entries at 6 p.m. From Nov to Feb the hours for Chillon are from 10:00 a.m. to 5:00 p.m. At any other time of year the hours are 9:30 a.m. to 6 p.m.
How to tour Chillon Castle: You can wander around on your own, using the free brochure/guide or rent an audio guide for CHF 6. If you want to download the audioguide beforehand on your own device it’s only CHF 3. Note: Below you’ll find some affiliate links, which means I make a small commission if you book through my site at no extra cost to you. 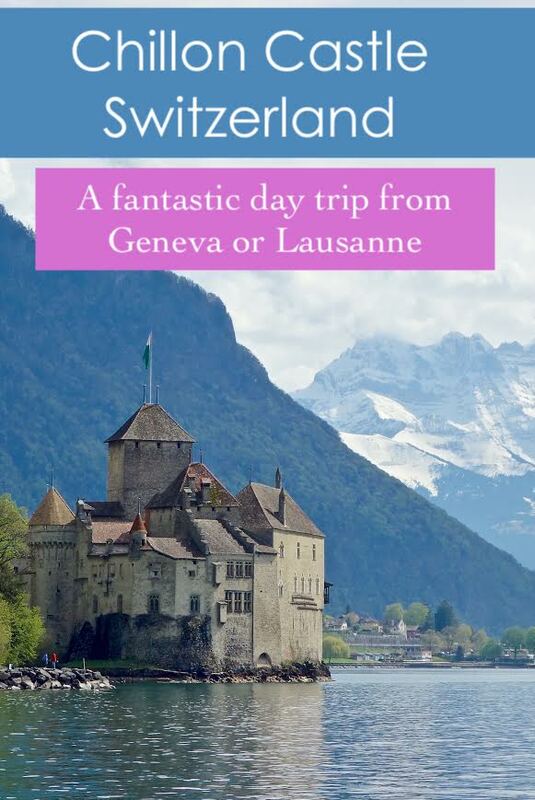 If you don’t want to bother with public transportation there are plenty of day tours from Geneva or Lausanne that offer highlights of Montreux and Lake Geneva, including a visit to Chillon. 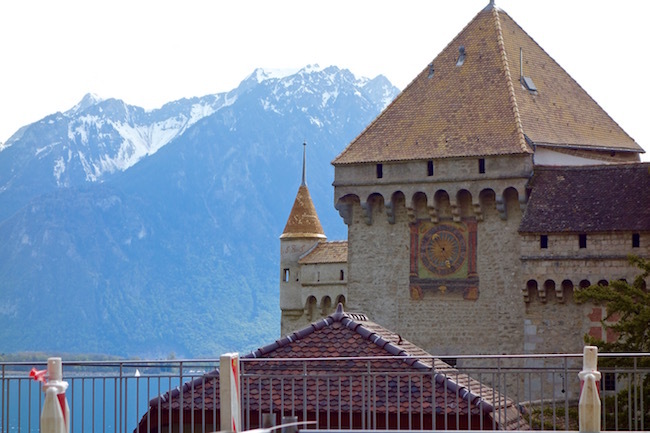 Tours to Chillon from Geneva: A 9-hour Swiss Riviera Tour of Vevey, Montreux and Chillon starts at $161 US. Book here. 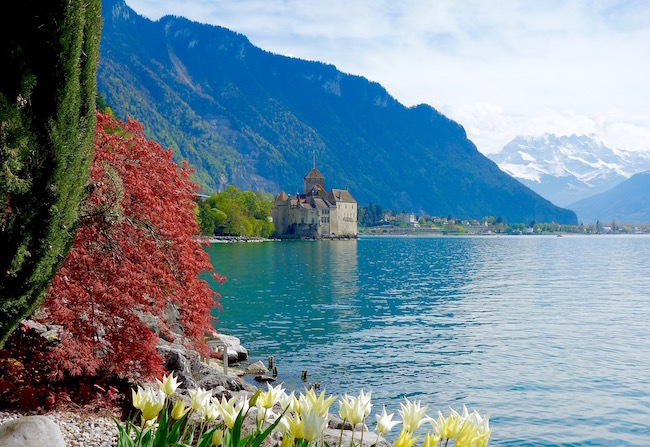 Deluxe: A private tour from Geneva with a stop at the Olympic Museum, the Chateau de Chillon and the wine terraces of Lavaux for a group of up to four can run you around $700. Check details here. 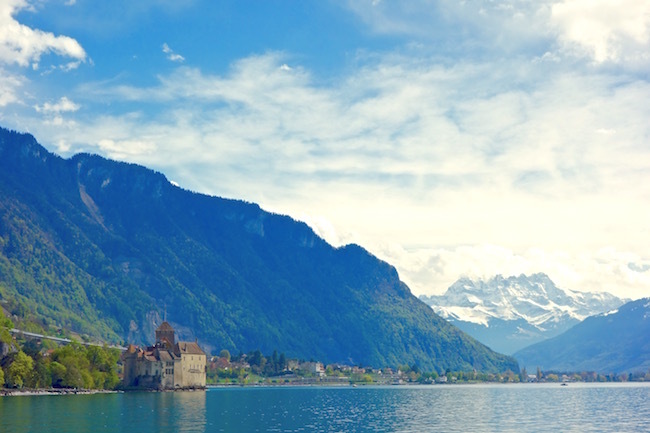 From Lausanne: a 10-hour Swiss Riviera Tour starts at $150 US and includes a taste of wine at the UNESCO World Heritage Site of Lavaux, a steamer boat cruise on Lake Geneva, a visit to Chaplin’s World and to Chillon Castle. Book the tour here. 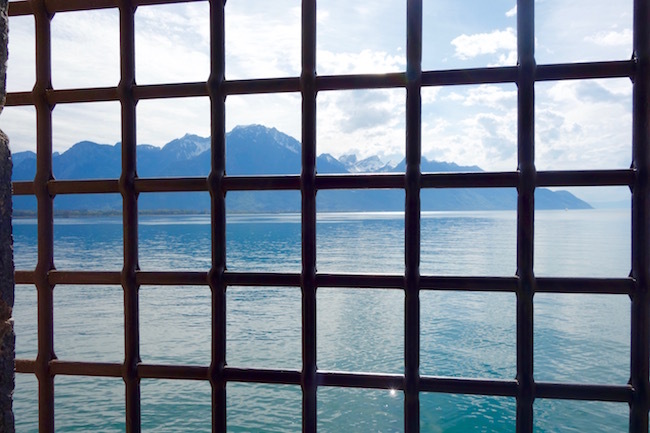 If you’re visiting Chillon, Montreux makes an excellent base. Other good options include Vevey and Lausanne, while Geneva and Evian-les-Bains are slightly farther away. There are some fabulous hotels on Lake Geneva. My favourite hotel is the glamorous Beau Rivage Palace hotel in Lausanne. If you want to stay in Montreux the Fairmont Montreux Palace is a beauty. The sophisticated Le Mirador Resort & Spa in Vevey offers a hilltop view of Lake Geneva and a holistic wellness spa. I also stayed for a week at the modern Hilton Evian-les-Bains on the French side of Lac Leman (Lake Geneva in French). It’s the sleekest Hilton I’ve stayed at, with a great location and cheaper than the other hotels I’ve mentioned. There are plenty of cheaper hotels in Geneva and around the lake. For prices and availability check out the hotel search box below. For info on visiting the Castle of Chillon or to book tickets online visit the official website. For travel in Switzerland visit the Swiss Tourism website or visit my Things to do in Switzerland page. 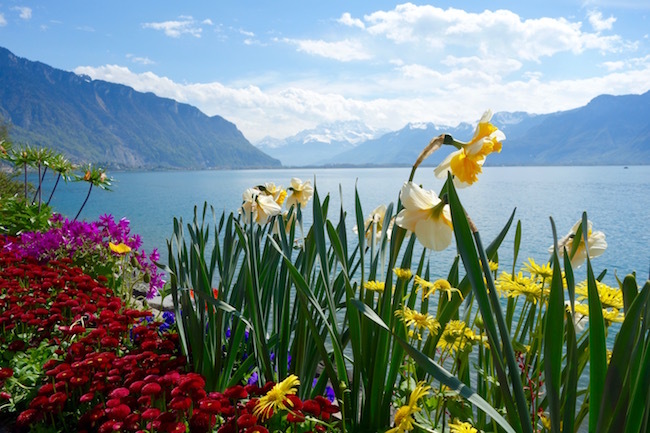 What else to see around Lake Geneva: Just next to Montreux is the lovely town of Vevey. Read my blog post on the fascinating new Chaplin Museum: Chaplin’s World. Or explore the French spa town Evian-les-Bains.